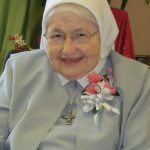 Sister Mary Janene entered into her eternal reward for a long and rich life of service and dedication to proclaiming the goodness of a loving God. Jane Elizabeth was born into the family of John and Irene Willitzer Russell as the third of eight children. 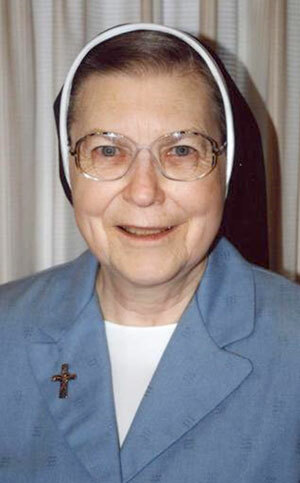 She attended Blessed Sacrament School and Notre Dame Academy during her primary and adolescent years. Jane took her place as an older sister who was always devoted to each of her siblings, looking forward to gatherings of extended family every few months to celebrate birthdays and enjoy holidays when she was able to see her many nieces and nephews and grandnieces and grandnephews. 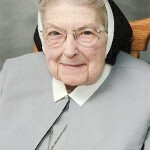 In 1947, she joined the community of the Sisters of Notre Dame and proceeded with further education at Mary Manse College and the Catholic University of America. 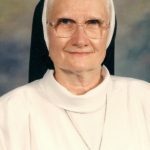 Sister Mary Janene spent the first sixteen years of her teaching career in the elementary schools of the Diocese of Toledo. The next twenty-six years she taught Religion, Math, and Business courses in Catholic high schools. Sister’s frail health did not slow her down from caring for others and she spent her retirement years processing medical bills and insurance claims for the Sisters of Notre Dame community for 14 years. Again, her precise nature served her well in this ministry. Sister enjoyed watching sports, traveling to new places, and helping those in need. Gathering items for fire-fighters involved in the tragedy on September 11, 2001; collecting cancelled stamps to be redeemed so money could be given to women and children in need; and volunteering hours to the Mercy St. Anne Hospital, Read for Literacy Program, and the Sanger branch of the Toledo Public Library brought her much joy. 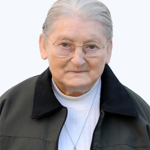 In February of 2014, Sister Mary Janene’s deteriorating health made it necessary for her to move to the Ursuline Center. This was a difficult move for Sister and she missed being in daily contact with her sisters at the Provincial Center. Her attitude gradually became one of abandonment to whatever God had in store for her and she accepted setbacks in her health trusting in God’s providential care. In her 65th year of Profession, Sister Mary Janene traveled to her eternal home where she is reunited with family, friends, and sisters. We rejoice that she is now freed from all infirmity and is united with her Redeemer. May she rest in peace.